i) add any missing lone pairs. ii) show delocalization using resonance structures. 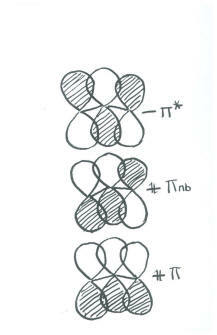 iii) show delocalization using drawings of the orbitals used in pi bonding. The molecule acetamide is shown in problem MO14.1. Explain the following structural features. a. In acetamide, the C-N and C-O bond lengths are 1.334 and 1.260 angstroms, respectively. For comparison, some typical bond lengths are C-N (1.47 A); C=N (1.38 A); C-O (1.43 A), C=O (1.20 A). b. The two C atoms, plus the O, the N and the two hydrogens on the N lie in a plane. c. The barrier to rotation about the C-N bond is approximately 11 kcal/mol, while the barrier to rotation about the C-N bond in CH3NH2 is about 2.4 kcal/mol. d. The two hydrogens on the N are not in identical chemical environments.